This slow cooker ragu is every bit as luscious and comforting as you would expect it to be. 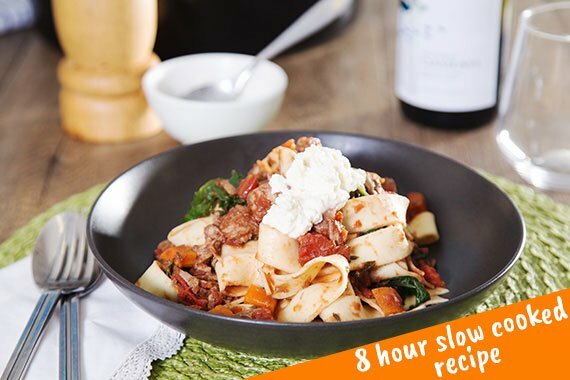 Super quick to organise in the morning at the start of your day - It’s packed with juicy tomato and garlic flavour and shredded beef that swims in a little tomato gravy, that is on point for some fresh pasta from our friends at iPastai. Important Note: This is a 'slow cook' recipe, so it must be started in the morning. You can also cook in a low oven, around 120°C, in an oven tray covered with foil for 8 hrs. Wash the fresh produce. Peel and roughly chop garlic. Roughly dice carrot. De-stem silverbeet, keeping stems and leaves separate. Make sure that you wash the stems well to ensure that all the dirt is removed. Thinly slice silverbeet stems. (Tip: roughly chop silverbeet leaves and set aside, covered in the fridge for use in step 4 of the recipe). Pat dry the beef with paper towel. Season the beef with salt and pepper to taste and transfer to the slow cooker. Pour the tinned tomatoes, tomato paste, beef stock concentrate and ¼ cup of water over the beef. Add garlic, carrot, silverbeet stems and thyme leaves. Cover and cook in slow cooker on low for 8 to 10 hours. Put a large pot of salted water onto boil for cooking pasta in step 4. Shred the beef using 2 forks or tongs. Remove silverbeet leaves from the fridge. Add pappardelle and silverbeet leaves to the pot of boiling water. Cook pasta and leaves for 2-3 minutes, until al-dente or to your liking. Drain well. Add drained pasta and silverbeet to beef ragu in the slow cooker. Mix well, check and adjust seasoning. Divide between plates and top with ricotta. Enjoy!